I woke up to icy streets and sidewalks on Monday morning, bah humbug. My Facebook bicycle club was filled with slip-sliding stories from normally “I-bike-everywhere-why-don’t-you” badasses, so I decided to leave the wheels at home and walk to S.’s place in Waverly. I zig-zagged my way via the driest-looking sidewalks and noticed a pattern. Snow stays on any spot not in the sun, leaving patterns like this one, where the snow matches the shadow thrown by this giant SUV. Clearly, the solution to icy patches on the sidewalk is to ban all shadows. Or maybe treat sidewalks with the seriousness we treat cars, whose safe passage dominates our worries on snow days. Or there was the guy I passed on my evening walk over to J. and A.’s place whose solution was to knock the ice patches with a hammer to loosen them before scraping them off the sidewalk with a shovel. Oh, winter, enough already! 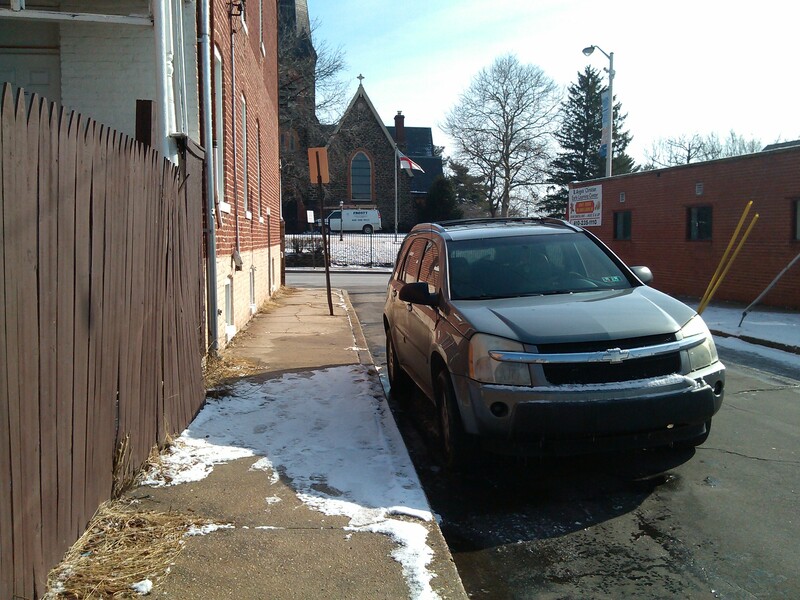 This entry was posted in weather and tagged Baltimore, cold weather, ice, snow, walking, Waverly. Bookmark the permalink. “snow stays on any spot not in the sun.” Yep. Ain’t nature amazing? Winter: enough already. My spirit droops. I want to pull all the hair out of my head.